80 year old Gamay vines. Rémi and wife Laurence work the vines organically. Under the mentorship of Foillard, Rémi's wines garnered a cult following in the Parisian natural wine scene. 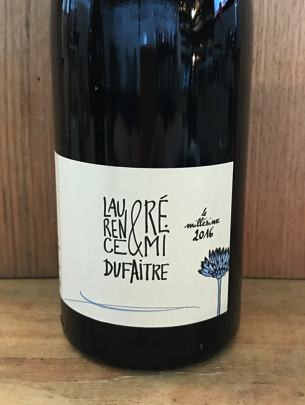 Rémi is a member of the now infamous group that has evolved from Kermit Lynch's 'gang of four', the producers in Morgon who studied with natural wine pioneer Jules Chauvet (winemaker and biologist). The 2016 Cote de Brouilly is made from top of the hill on Schiste ground, 40-60 year old vine is a stronger cuvee. Carafe to start, volatility can be present on the nose. Rémi makes wines in a classic carbonic style, using whole bunches, which are carefully sorted to avoid broken grapes or rot. He adds some carbon dioxide gas to protect the grapes at the beginning of fermentation, and does not use any temperature control. He avoids foot stomping the grapes unless he sees some volatility starting to creep in. His goal is to have as little juice in the tank as possible. He also performs routine analysis to see how the yeast is performing and whether or not there is any volatility. Remi makes all his wines with the same method, thus we can really see and taste the differences between the sites, with minor differences in the elevage of each cuvée. He tastes each cuvée before bottling, and may decide to add between zero and 2 mg of sulfur, depending on how stabile he judges the wine to be.